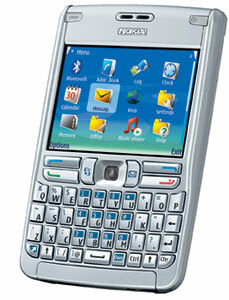 As expected, Cingular has launched the Nokia E62. The E62 is Nokia's North American targeted version of the E61. It's one of only a few models that Nokia has shipped with a QWERTY keyboard. Cingular is selling the Nokia E62 for just $149.99 after a $50 mail-in rebate. That price includes a 2-year service contract but does not necessitate an unlimited data plan (like Verizon's lowest price for the Q does). Cingular is currently selling the Treo 650 for $299.99, twice the price of the E62.